If you are a data scientist looking for a lightweight code editor for U-SQL, try ADL Tools for VSCode for rapid development. If you are a developer looking for a modern, simple U-SQL development tool, try ADL Tools for VSCode. 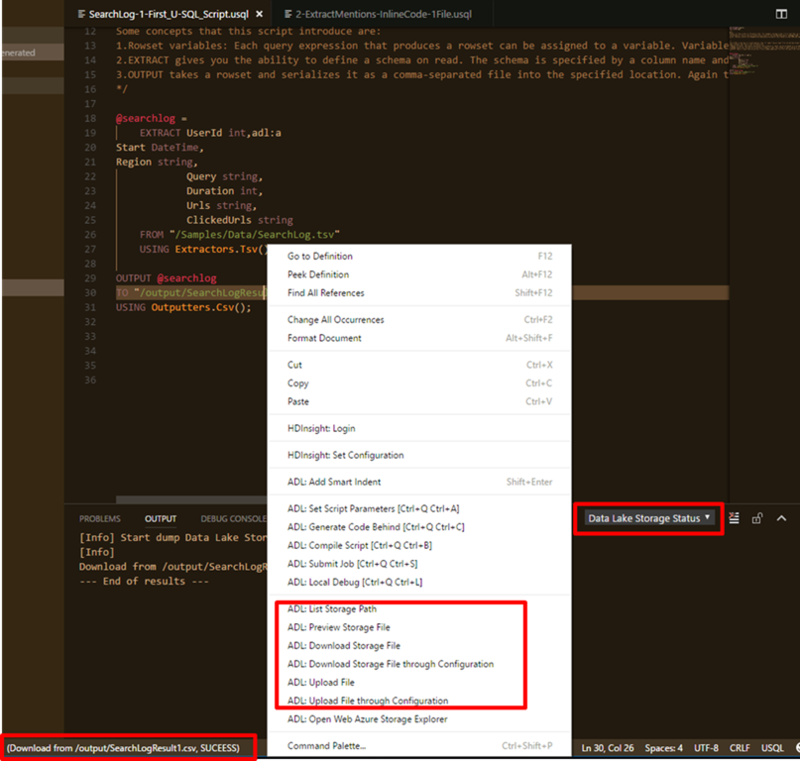 If you prefer to use Mac or Linux for your development, install ADL Tools for VSCode and get started with U-SQL development. U-SQL is a programming framework built for scaling out big data queries and running them in a serverless cloud environment. In addition to being able to run SQL-like queries directly, the U-SQL framework makes it easy to plug in your R, Python or .NET algorithms and scale them out in the same easy, declarative style as SQL. We are excited to share the recent release for VSCode Azure Data Lake Tools, a cross-platform code editor to allow you easily to author and submit U-SQL file to Azure Data Lake Analytics (ADLA). We have greatly improved the getting started experience, enhanced usability of the tools, and improved the integration with Azure Data Lake Storage (ADLS). The ADLS integration allows you to easily preview files, list storage paths, and download or upload files with exceptional performance. To maintain the VS Code lightweight approach, we removed the .NetCore and Java dependencies in the extension. For Windows users, you can start to use Azure Data Lake Tools for your U-SQL development right after you install the extension. For non-Windows users, you can install Azure Data lake Tools, then follow the reminder to install .NetCore and Mono. Get the latest ADL Tools by going to the VSCode Extension repository or VSCode Marketplace and searching “Azure Data Lake Tools for VSCode”. If you encounter any issues, please submit them on GitHub. Want to make this extension even more awesome? Share your feedback.